Background Physical activity (PA) at leisure by the elderly, and its relationship to cardiovascular (CV) and non-CV mortality, with and without competing risk, has been scarcely described. We determined the relationships between PA, smoking and 12-year CV, non-CV and all-cause mortality in elderly Oslo men screened for CV disease in 1972–1973 and 2000. Methods Among 14 846 men born during 1923–1932 and participating in 1972–1973, there were 5738 participants in 2000. During the 12 years follow-up 2154 died. Cox regression modelling of mortality endpoints, with and without competing risk, was applied analysing PA variables hours per week of light or vigorous PA intensity and degree of PA at leisure. Comparisons of predictive ability between PA and smoking were done by receiver operating characteristics. Results Thirty minutes of PA per 6 days a week was associated with about 40% mortality risk reduction. There was a 5 years increased lifetime when comparing sedentary and moderate to vigorous physically active men. Associations to CV or non-CV mortality were slightly weakened, allowing competing risk. Conditional on the prevalence of smoking and PA, the degree of PA at leisure was almost as predictive as smoking with regard to the effects on mortality. Increase in PA was as beneficial as smoking cessation in reducing mortality. Conclusions Even at the age of 73 years, PA is associated highly with mortality between groups of sedentary and active persons. Allowing for competing risk did not weaken these associations markedly. Public health strategies in elderly men should include efforts to increase PA in line with efforts to reduce smoking behaviour. Comparisons of predictive power between physical activity and other risk factors for morbidity and mortality have been reported, but its results would depend heavily on how physical activity was defined and what measures of predictive ability were used.8 When analysing CV mortality in elderly participants, degree of competing risk will become substantial if follow-up is extended over longer periods of time. Ordinary Cox regression models will censor non-CV deaths and thus, shorten follow-up time with regard to CV mortality. Few reports of physical activity versus mortality have taken this into account. The Oslo I CV study took place in 1972–1973, when all men aged 40–49 years were invited to a screening examination.9 ,10 In year 2000, these attending men were invited again to an extended screening examination of CV health, called Oslo II.11 Mortality of those who participated at both screenings was followed with respect to CV and non-CV mortality until 31 December 2011. The major exposure variables were degree of physical activity at leisure, hours per week of light and vigorous intensity physical activity. The purposes of this study were: to estimate the relationships between exposure variables and 12-year CV, non-CV and all-cause mortality in elderly men during the first decade of the 21st century; to compare estimates with those derived from competing risk Cox regression models and finally, to compare relative risks of 28-year changes of the different activity exposure variables with that of changes in smoking habits. The Oslo study has been described in detail elsewhere.9 ,10 In short, 25 915 men born in 1923–1932 were invited to a screening examination in 1972–1973 and 16 203 participated (63%). Conventional risk factors included non-fasting total cholesterol, systolic and diastolic blood pressure, and cigarette smoking. In addition, body height and weight were measured. The so-called Gothenburg questionnaire regarding degree of physical activity at leisure were elicited12 and the question has been well validated13 (sedentary: reading, watching television or other sedentary occupation; light activity: walking, bicycling or other forms of physical activity including walking or bicycling to and from working place, and Sunday walk for at least 4 h a week; moderate activity: exercise, sports, heavy gardening, etc, for at least 4 h/week; vigorous activity: hard training or competitive sports regularly several times a week). Men with a history of previous CV diseases, treated hypertension or diabetes were excluded from the analyses as well as men with missing values. This left 14 846 participants in Oslo I. In year 2000, the surviving Oslo I study men (n=12 764) were invited to the Oslo II screening examination where the same variables and methods were applied. There were 6014 attending participants (47%). However, other variables and characteristics were also measured, such as hours per week of light and vigorous intensity of physical activity (time spent on physical activity per week: none, <1, 1–2, 3+ hours), and history of previous diseases such as diabetes, myocardial infarction, stroke, length of education and high-density cholesterol.11 In some prediction analyses, we calculated an activity intensity variable consisting of nine categories, by combining the 4×4 matrix of light and vigorous intensity categories. The two intermediate categories (2 and 3) were collapsed for each variable. Analysis of CV (ischaemic heart disease, heart failure and stroke), non-CV and all-cause mortality were confined to the period from screening examination early in year 2000 to end of year 2011, almost 12 years of follow-up. In this period, 2154 deaths occurred among the 5738 included men who participated in Oslo I and in Oslo II. This study was approved by a Regional Ethics Committee for scientific research in Norway, the Norwegian Data Inspectorate, and the Ministry of Health. The study complies with the Declaration of Helsinki. 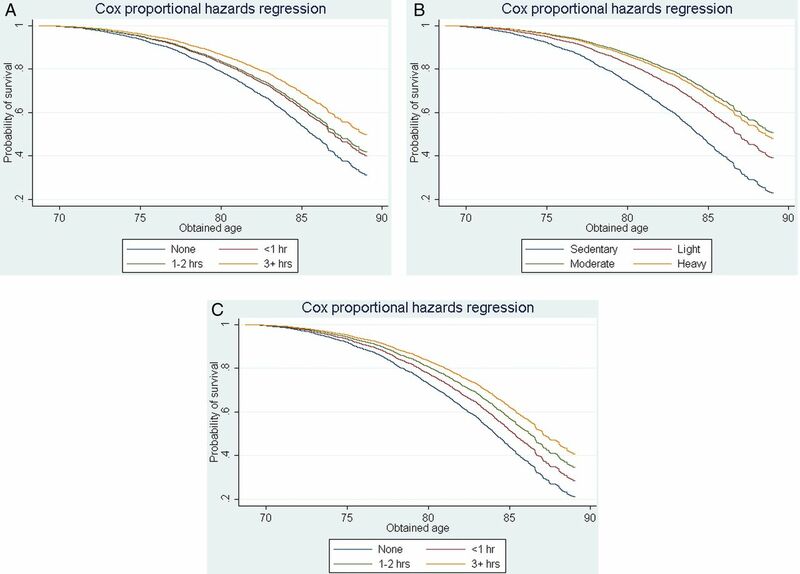 Cox regression models were used to compare the various outcomes according to levels of exposure variables (lowest level as reference), adjusted for age, smoking, diabetes, length of education, previous myocardial infarction and stroke. Exposure factor analysis for CV death, using non-CV death as a competing risk, was performed using the method of Fine and Gray.14 The predictive value of risk factors versus mortality was analysed by receiver operating characteristics (ROC) statistics. Model comparisons were made versus a full model with all selected risk factors. To check the assumptions of proportional hazards in the Cox regression models, time variant Cox regression models were run with time multiplied by exposure factor as the time-dependent covariate. For none of the end points or any exposure variable was there such a significant interaction term (data not given). Table 1 gives an overview of the distributions of CV, non-CV and all-cause deaths according to the levels of the exposure variables: time of light and vigorous physical activity per week, and Gothenburg question of physical activity degree at leisure. Also included in table 1 are the distributions of the adjustment factors. Degree of physical activity at leisure category 4 had few deaths and gave non-robust mortality results. Concerning the three exposure activity variables there were negative associations to all outcome measures. Gradients measured by relative risks were slightly stronger for CV than non-CV mortality; however, for non-CV mortality too the gradients were substantial. Adjusted analyses of the exposure activity variables versus the different causes of death are given in table 2. Irrespective of exposure factor for each outcome, the gradients were highly statistically as well as clinically significant. Less than 1 h of light activity per week was not sufficient to reach a statistically significant degree of risk reduction in any outcome, whereas higher amounts of light activity seemed to bring substantial associated risk reductions (32–56%). For vigorous, on the contrary, less than 1 h/week was associated with 23–37% risk reduction, and highly significant for all end points. The lowest risk had the group with the longest intensity of vigorous intensity activity (36–49% risk reductions). For degree of physical activity at leisure, mortality gradients were again strong, especially for non-CV and all-cause mortality (38–57% risk reduction from sedentary to the intermediate level). Figure 1A–C displays estimated probabilities for obtained age by levels of the three exposure variables. For all exposure factors, higher levels of activity were associated with 3–5 years extended lifetime (largest increase for Gothenburg question) as compared with lowest level, even in these elderly men. (A) Probability of survival until obtained age from year 2000 by amount of light intensity of physical activity per week, adjusted for educational length, smoking, diabetes, previous myocardial infarction and previous stroke. (B) Probability of survival until obtained age from year 2000 by amount of vigorous physical activity per week, adjusted for educational length, smoking, diabetes, previous myocardial infarction and previous stroke. (C) Probability of survival until obtained age from year 2000 by degree of physical activity at leisure, adjusted for educational length, smoking, diabetes, previous myocardial infarction and previous stroke. To investigate whether changes in activity and smoking habits between the two screenings are associated with the subsequent mortality from year 2000, five categories of changes in activity and four categories of changes in smoking habits were created. For inactive men in Oslo I who had increased their degree of activity at Oslo II, the mortality rate was 44 (26–57)% lower as compared with sustained sedentary activity behaviour. Those who were at least intermediately active at Oslo I but sedentary at Oslo II had the same mortality as those who were sedentary at both occasions. Those who quit smoking between the Oslo I and II screenings had 31 (18–41)% lower mortality than those who smoked at both screening times. For CV, mortality there was a great degree of competing risk of non-CV mortality, but this was less so the other way around. The models applied above treated non-CV deaths as censored observations when CV mortality was analysed and vice versa when non-CV death was analysed. In table 3 relative risks are displayed for CV and non-CV death. Risk gradients were in the same direction as above but the strengths were somewhat weaker, though these still remained statistically significant in important cases judging from the CIs not covering 1.0. With respect to the two intensity questions, significance for CV death occurred for the highest intensity categories and for the Gothenburg question, in the intermediate category. Since degree of competing risk was less for non-CV as compared with CV mortality, risk gradients were less influenced by competing risk for non-CV as compared with CV death. Table 4 gives ROC area values for CV, non-CV and all-cause mortality for different models. The first line shows ROC areas when all factors are included. The second line gives the decrease in area (0.013) when the two activity variables are included, but not smoking. When the Gothenburg question variable (line 4) is excluded but smoking included, the reduction amounts to 0.011. When both activity variables are excluded but smoking included (line 5), the ROC area reduction is 0.019. Thus, the ROC area contribution for activity seems to be about as large as that of smoking, over and above common adjustment factors. Physical activity at leisure—as well as light and vigorous intensity activity—is associated powerfully and negatively to CV, non-CV and all-cause mortality. The competing risk Cox regression model weakened the results, but the highest categories of the intensity questions and intermediate category of the Gothenburg question were still significant for CV death as compared with reference. The highest category of the Gothenburg question did not have sufficient power. For non-CV deaths, results were not much different as compared with total mortality due to the high percentage of such deaths. Increased physical activity may introduce as much mortality reduction as smoking cessation in this age group. A recent meta-analysis2 reported that an energy expenditure corresponding to 1000 Kcal/week was associated with 20–30% reduced mortality, covering all ages and both genders. This amount is comparable to the moderate and intermediate degree of our exposure variables at leisure. Wen et al7 showed in a large study from Taiwan that 15 min of daily activity at a low intensity was associated with a 14% risk reduction through a 3-year follow-up with a further dose–response reduction of 4% for each 15 min increased activity. This was somewhat weaker than observed in our data, but the authors adjusted for 13 variables (such as blood glucose and systolic blood pressure) that may have resulted in overadjustment. The Gothenburg activity question showed a remarkably strong gradient with good ability to discriminate between persons with sedentary and intermediate/great degree of activity on median lifetime. Even when men were 73 years of age on average at start of follow-up, active persons had 5 years longer expected lifetime than the sedentary. This question measures type, amount and intensity of activity in a somewhat unstructured way, whereas the two intensity questions are not specific on type of activity. This could be part of the reason why the Gothenburg question outperformed the two intensity questions with regard to prognostic ability. Men participating in Oslo I and II had 46% (43–49%) lower mortality risk than those participating in Oslo I only. It is plausible that non-attendants were more prevalent in those being sedentary and it is known from the Oslo I study mortality follow-up that non-attendants experienced higher mortality rates than attendants and that this was more pronounced in less educated than highly educated men.16 Thus, the large extended lifetime in the intermediate group of activity could even be an underestimate. There are more potential confounding factors than those adjusted for, such as serum glucose and lipoproteins. However, several of these could be a result of the physical activity level; so added adjustments for these could have led to overadjustments. In addition, Spearman correlation between degree of physical activity at leisure and at work was small (r=0.058) in 1972/1973, when also the degree of physical activity at work was recorded. Thus, confounding of occupational differences in degree of activity at work was probably small in this study. Historically, major emphasis has been put on the benefits to the CV system from physical activity. Also this study confirmed the strong and negative association between exposure activity variables and CV mortality. However, non-CV mortality was also strongly and negatively associated to all such variables. Thus, physical activity seems to affect many organ systems and may protect individuals from premature death even at an older age. The estimates of CV mortality according to exposure variables may have been biased due to a high degree of competing risk. In the standard Cox model of time to CV death, preceding deaths are usually censored. This precludes CV death from occurring, making the exposure time shorter than it would have been had death not occurred. As a result, the rate of CV death defined as the number of CV deaths divided by total exposure time will be biased upwards due to the smaller denominator, thus overestimating the probability of CV death occurring within a certain time. The bias increases if the absolute risk of non-CV death increases. This approach does not provide information on the risk of CV death in participants who die first by a non-CV death, but risk factor associations with CV death can be provided for all participants, irrespective of whether they experience a non-CV death or not. However, the model is dependent on the assumption that the two end points are independent before either CV or non-CV death occurs, after adjustment for risk factors included in the model. Unfortunately, this assumption cannot be tested. The effect of competing risk will depend on the degree of competition by non-CV death, and it becomes progressively more important as absolute risk of non-CV death increases. Over and above these considerations, associations with risk factors may differ when comparing a standard and a competing risk Cox model, since the magnitude and direction of differences may vary according to the observed data, depending on how these factors are associated with both end points. However, a model including competing risk will probably give a better description of what is actually happening. In our situation, especially when analysing CV death, the competing risk model may give a more accurate risk estimate than the traditional model. The competing risk model estimated somewhat weaker gradients than the ordinary Cox regression model, more for the CV than for the non-CV end point. However, the main impression of a clear dose–response relationship for each exposure variable and each end point remained on the overall unchanged. In the physical activity versus mortality literature there are a few reports taking competing risk into account, generally for the younger participants: two regarding dose–response relationships between degree of walking and CV mortality, and other causes,17 ,18 and one in women.19 In these studies, total mortality was considerably lower than in our study and thus, degree of competing causes was also reduced. However, these confirmed the dose–response relationship between degree of physical activity and CV mortality. In the ROC analysis of risk comparison between physical activity and smoking measured in year 2000, the Gothenburg question variable was almost as predictive as smoking despite adjusting for the activity intensity variable. However, by collectively using both activity question variables, these performed better than the singular smoking question variable. Increase in degree of physical activity at leisure had about equal predictive values as smoking cessation on all-cause mortality; this has also been found in a Swedish study.20 Such comparisons are obviously conditional on the prevalence of smoking and the various levels of activity. In year 2000, the prevalence of daily smoking was 20% among those who attended both studies. Since smoking behaviour has diminished to a large degree during the last decade also in Norway, it is reasonable to believe that the smoking prevalence now is more at the level of 15% in this age group. Thus, physical activity should be targeted to the same extent as smoking with respect to public health prevention efforts in the elderly. Only the healthiest participants of the Oslo I cohort attended the Oslo II study. Absolute risk levels were, therefore, biased downwards, but adjusted relative risks between levels of activity variables as well as added life times by increased activity may have been less biased. Also self-reported activity levels may have been biased and probably in the direction of reporting more activity than actually performed in line with comparison studies between self-reported and objectively measured physical activity.21 The set of adjustment factors used here was selected from previous studies and these are known to be associated both with mortality and physical activity. There was a strong and negative dose–response relationship between all physical activity exposure variables and CV, non-CV and all-cause mortality. A mortality reduction of 40% was associated with a moderate use of time (30 min 6 days a week) irrespective of whether the activity was light or vigorous. Modelling by competing risk of non-CV death on CV death and vice versa weakened associations to exposure variables to a certain degree, but associations were still significant. Increased physical activity was as beneficial as smoking cessation in reducing all-cause mortality. Public health strategies to reduce risk in elderly men should concentrate highly on promoting increased physical activity in their action plans. In elderly men, increased physical activity is as important for survival as quitting smoking. Both cardiovascular (CV) as well as non-CV mortality are reduced by increasing the degree of physical activity in a dose–response pattern. Accounting for non-CV mortality in a competing risk model when analysing CV mortality or vice versa showed a slightly weakened relationship, but the interpretation did not change. Thirty minutes of moderate activity 6 days a week was associated with 40% mortality risk reduction. More time and resources should be allocated in primary care to increase the degree of physical activity among the elderly. Equally more time and resources should be used to advice on smoking cessation as well as increased degree of physical activity in the elderly. Physicians should emphasise the broad spectrum of diseases and non-CV causes of death that can be prevented by an increased degree of physical activity in the elderly.
. The Oslo Study, cardiovascular disease in middle-aged and young Oslo men. Acta Med Scand 1975;588(Suppl):1–38. StataCorp.2011. Statrelease 12. Statistical software. College Station, TX: StataCorp LP, 2011.
. Coronary risk factors and their possible causal role in the development of coronary heart disease. Thesis. Norway: University of Oslo, 1982. Contributors IH made all statistical analyses for the mortality study and wrote the first draft. SAA made major revisions to the mortality study and contributed by a major extent to all sport scientific considerations. Ethics approval South Eastern Region Health Ethical Committee. Data sharing statement The data for the Oslo study are stored at the Norwegian Institute of Public Health in Oslo, Norway. All scientists may apply to use the data for getting solutions for their interesting scientific questions.